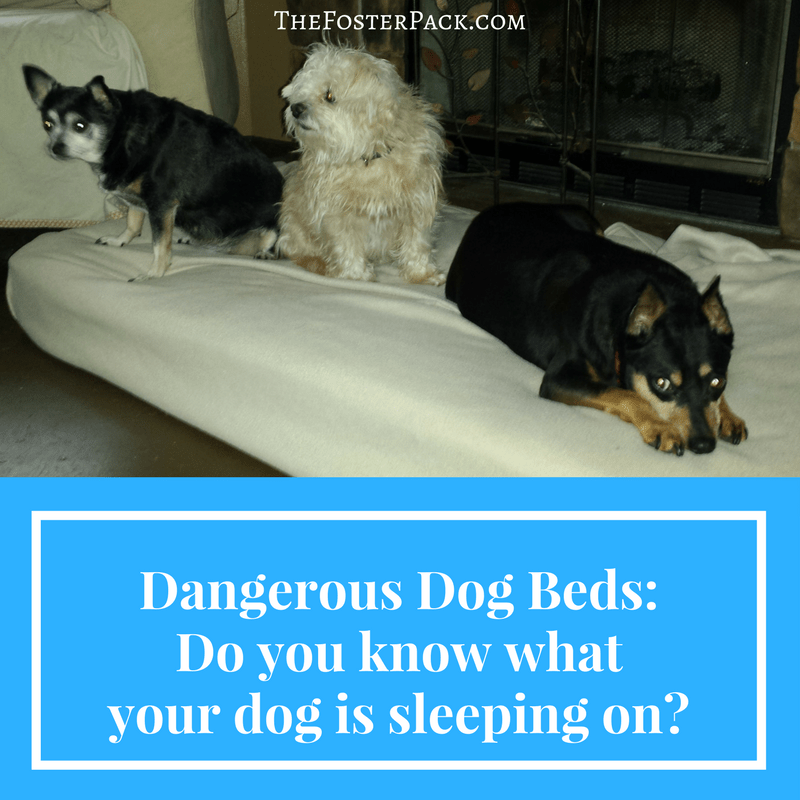 Home > Life with Dogs > Dog Health > Dangerous Dog Beds: Do you know what your dog is sleeping on? Dangerous Dog Beds: Do you know what your dog is sleeping on? As pet parents, we work hard to make a good life for our dogs. We buy good, quality dog food, even though it’s slightly more expensive. [amazon_textlink asin=’B00S7ZTFXS’ text=’Chew proof dog toys’ template=’ProductLink’ store=’fosterpack-20′ marketplace=’US’ link_id=’50b057f1-3bdb-11e7-9ff6-015f9fd4e5c7′] for the breeds we have. We want our dogs to have [amazon_textlink asin=’B01H7L8OXE’ text=’comfy dog beds’ template=’ProductLink’ store=’fosterpack-20′ marketplace=’US’ link_id=’ca44e9e4-3bdb-11e7-9bb0-e9418b7dfba7′], and do our best to buy the best. We never expect the products that we buy for our dogs to harm them. We try to get the best for out pets. But we don’t always know how the dog beds are made. Or what exactly is inside of them. Unfortunately, sometimes we find out the hard way when tragedy strikes. Then we want to warn everyone about the dangers of certain products aimed at our love of our pets. It’s unfortunate when things like this happen. But the best thing we can do is warn the rest of the world, and try to save some lives that way. We go through lots of [amazon_textlink asin=’B00IHM4SKQ’ text=’dog beds’ template=’ProductLink’ store=’fosterpack-20′ marketplace=’US’ link_id=’2b65800a-3bde-11e7-bc1a-b31dc7643145′] here, with all of the foster dogs and puppies that we have through here. For our main dog beds, due to the fact that a lot of the dogs here are seniors, we use [amazon_textlink asin=’B004HKK5TK’ text=’crib mattresses’ template=’ProductLink’ store=’fosterpack-20′ marketplace=’US’ link_id=’4130e050-3bde-11e7-af1e-0bb4ffcd6d68′]. I pick them up at yard sales in the summer for a few dollars a piece. We put blankets, or [amazon_textlink asin=’B00NZK5G2E’ text=’crib sheets’ template=’ProductLink’ store=’fosterpack-20′ marketplace=’US’ link_id=’4e0b6eaf-3bde-11e7-bf0b-114c32810b47′] over them, and the dogs love them. It helps the older dogs with their achy joints. Crib mattresses, are also waterproof, and can easily be wiped down in the case of accidents. Yes, they are kind of large size. For big dogs, they’re a perfect size. For our smaller dogs, it just means they can cuddle up with three or so on the beds. I think that’s another reason they like the crib mattresses so much. [amazon_textlink asin=’B0030UUBMO’ text=’Portable crib mattresses’ template=’ProductLink’ store=’fosterpack-20′ marketplace=’US’ link_id=’bb2f0a8e-3bde-11e7-b9bd-c1f8dea98b45′] also work great and are slightly smaller. Let’s Get Zane Adopted, 2.5 Year old PitBull Terrier, Looking for love! I was searching for some resourceful blogs and discovered your’s site. I’m truly been enticing with your amazing writings! Thanks for sharing this great post!